Hanson shouts it out in Manila once more! Hanson is an American pop rock band composed of brothers (L-R) Isaac, who handles the guitar, vocals; Zac on the drums, vocals; and Taylor Hanson with the piano and vocals. Their debut album Middle of Nowhere earned three Grammy nominations in 1997. Manila “MMMBopped” one more time as the Hanson brothers conquered the Big Dome last Friday night, March 30, for their Shout It Out Concert Tour. 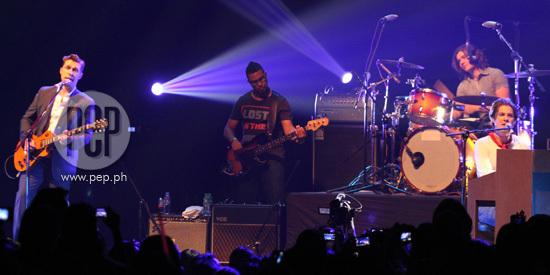 The band first came to Manila in November 2004. A small but solid crowd of loyal fans went to the Smart-Araneta Coliseum and had a trip down memory lane with Zac, Taylor, and Isaac. Concert King Martin Nievera’s son Robin Nievera, who’s also slowly making a name in the music industry, was the front act for the evening. The fans could not suppress their excitement as the Hansons opened the concert with the single “Waiting for This,” aptly expressing how everyone present felt that night. From their 1996 album MMMBop, they sang “Thinking of You” and “A Minute Without You” from the 1997 album Middle of Nowhere. They followed it up with “Can’t Stop” from the album This Time Around. “Hello, Manila!” Isaac said. “Thank you all very, very much for coming and seeing us tonight. “This is a song called ‘Strong Enough to Break,’” he introduced the single from the 2004 album Underneath. Every time the camera focused on drummer Zac, as seen on the LED screen, adoring female fans let out screams of excitement–especially those from the upper seats who could only see the drummer from afar. Zac can be considered the heartthrob among the three, though the other members are equally appreciated for their musical talents. Zac added, “Are you guys havin’ a good time tonight? It took us long to come back, so I just want to greet everybody who patiently waited to join us here, after a few years. This goes out to you." “We’ve heard rumors that you guys can sing and dance as well. So we’re gonna see…” Taylor declared. “All you guys have to sing is, ‘Whoa, whoa!” Taylor said. “They were right, you guys can sing,” he said after the performance. “What a great night!” Taylor exclaimed. “So, we’ve got this new album, Shout it Out, that just came out, finally. Taylor offered the song “Give A Little” to the guys in the audience who were a minority. “Well, thank you guys for being here fifteen years after the first song came out. We were thinking about sticking around for at least fifteen years more. “You guys gonna be here fifteen years from now?” This was met with resounding cheers. The spectators did jump and enjoyed the song. “Thank you all so much for being with us!” said Taylor as he also expressed gratitude to their back-up band. “You all have a good time tonight!” and the brothers waved their hands, bowed to the audience and exited the stage. The people were not to be moved from their seats even as the stage lights dimmed. They kept asking for more. The three came out after a few minutes. They performed “If Only” for the encore and the audience were as lively as they were when the show started. After the last song, the brothers went centerstage and hand in hand, took their final bow. The audience applauded appreciatively as they wait for another fifteen years. SPOTTED: Ex-lovers Kean Cipriano and Alex Gonzaga and Karylle with Yael Yuzon of Spongecola.